Mission accomplished! I finished the last page from our 4-state adventure last October before our upcoming 6-state trip. 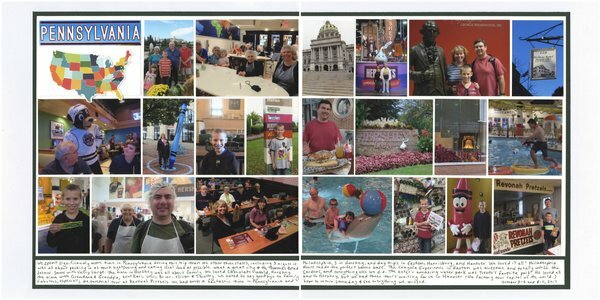 I'd debated splitting this into separate pages for the different parts of Pennsylvania we visited, but ultimately chose to show the diversity of the activities we did in the state in this 2-page spread. I loved looking back at all these photos. We had a fantastic time in Pennsylvania! Love love love this! LOVING how you used the map and loving all the photos!!!! !